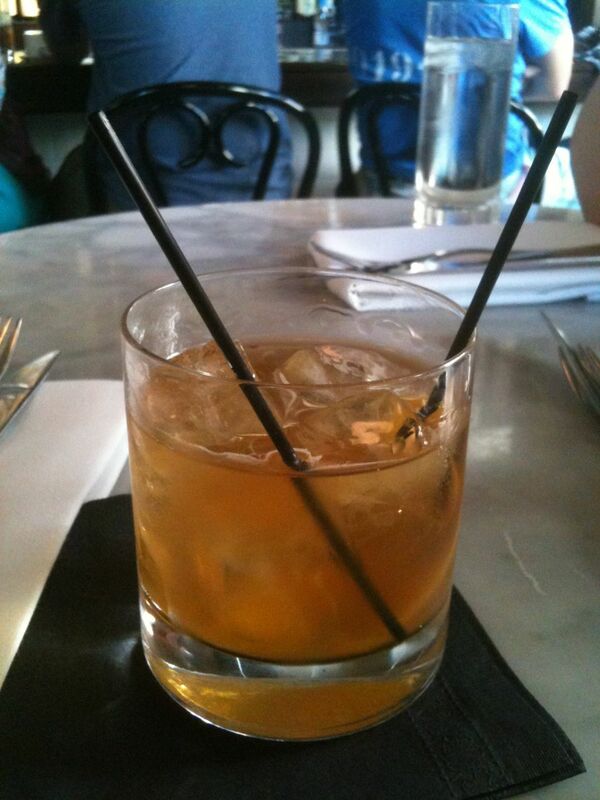 Village Whiskey is the fifth in Iron Chef Jose Garces‘ growing restaurant empire in Philadelphia, Pennsylvania. Opened in 2009, right next door to his highly successful tapas bar Tinto on 20th Street, Village Whiskey has been drawing huge crowds ever since. This upscale bar offers an extensive whiskey, bourbon and scotch selection, creative snacks including homemade pickles, and a hamburger touted by many to be the best in the city. So popular is Village Whiskey that it’s nearly impossible to get a table without a long wait, unless one happens to go during off hours. Checking out the menu at Village Whiskey. 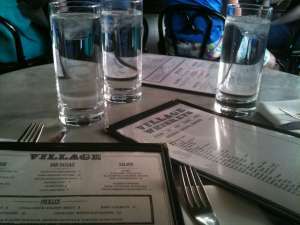 Thus it was that two friends and I decided to enjoy an early Saturday night dinner at Village Whiskey recently. 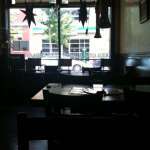 Arriving at 5pm, we were seated promptly in one of their high-seat booths near the front of the establishment. 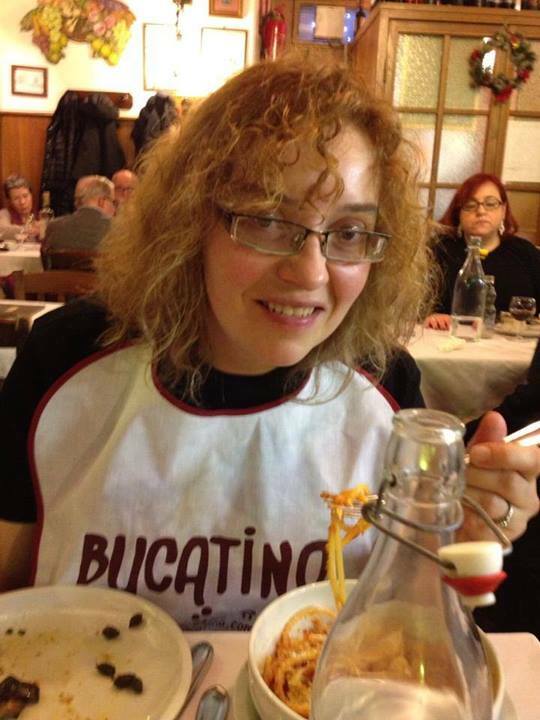 These are kind of odd seats, not the most comfortable for any larger diners–nor those with shorter legs. The booths face the attractive bar, where bottles of whiskey and other spirits rise all the way to the ceiling. The room is bright and airy with large windows facing out to the street, but the noise level is high, even early in the evening. We were quickly brought menus, the longest of which was the one listing whiskeys available by the 2 oz. glass. Whiskey is absolutely my favorite spirit–especially bourbon whiskeys–but the prices per serving kept me from sampling any of the vast offerings on Village Whiskey’s menu. I understand alcohol is how many restaurants turn their profit, but the markup here on simple shot pours is extreme. By example, I can regularly buy a 750 ml bottle of Wild Turkey 101 Bourbon for $21.99 at the Pennsylvania State stores. A 2 oz. pour of that same Wild Turkey 101 is $10 at Village Whiskey–nearly what half an entire bottle would cost me. That was actually one of the lower-priced selections; many whiskeys were listed at $20-40 per 2 oz., which was just too rich for my budget. I can understand such a high markup on wine by the glass, where an opened bottle does not stay drinkable past one night, but spirits do not have the same fast expiration once opened. It might be nice if Village Whiskey offered a tasting flight of smaller pours, such as El Vez in Philadelphia does for tequila. I would likely be more willing to splurge $20-30 for a chance to try several different whiskeys in such a fashion, versus paying so much just for one spirit. An Old Fashioned, Village Whiskey-style. As such, I decided to stick with the interesting cocktails on the menu. I started with an Old Fashioned ($11), featuring Bottle In Bond Bourbon, house-made bitters, sugar and lemon. This drink was a refreshing way to start the night, having a good sweet and spicy start, and then a lingering sharp note from the bourbon. Village Whiskey currently features 14 signature cocktails in the $8 – 13 range, many of course featuring whiskey, bourbon and rye but also several rum, tequila and gin-based drinks. I later would try their Philadelpia Fish House Punch ($8), which was made from peach brandy, cognac, dark rum, tea, lemon and spiced sugar. This was one of the best “rum punches” I’ve tasted in quite some time, not overly sweet and with a good complexity of flavor. The food menu is only one page long with fairly limited options. 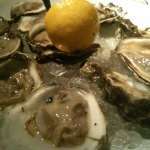 The raw bar features one clam and two oyster selections, $1.50 – $3 each. 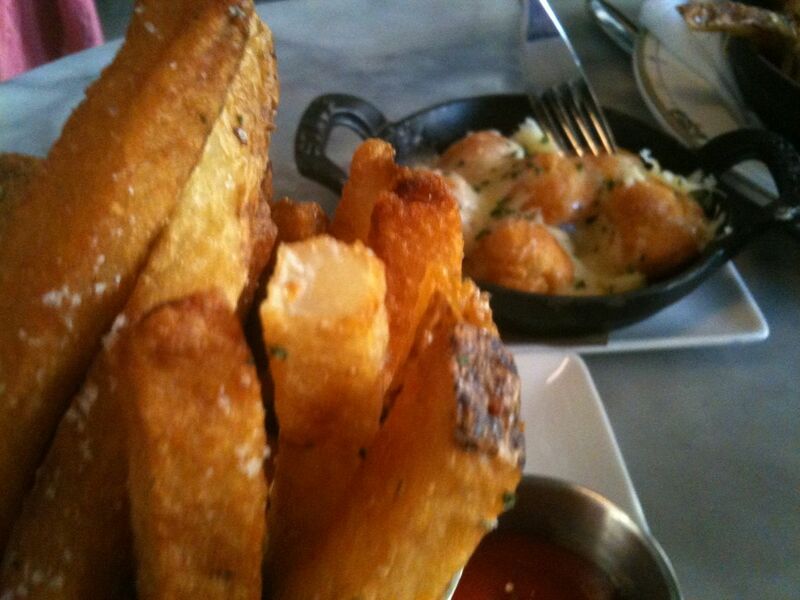 Bar snacks range from deviled eggs to herb-roasted oysters, $3 – $15. Two salad selections are available, a basic mixed greens for $9 and a Cobb with blackened chicken for $12. Unusual homemade pickles are offered, served with toasted sourdough bread, ricotta cheese and black olive tapenade. These pickles, including cherry tomatoes and truffle lemon artichokes, range from $4 to $12 per serving. 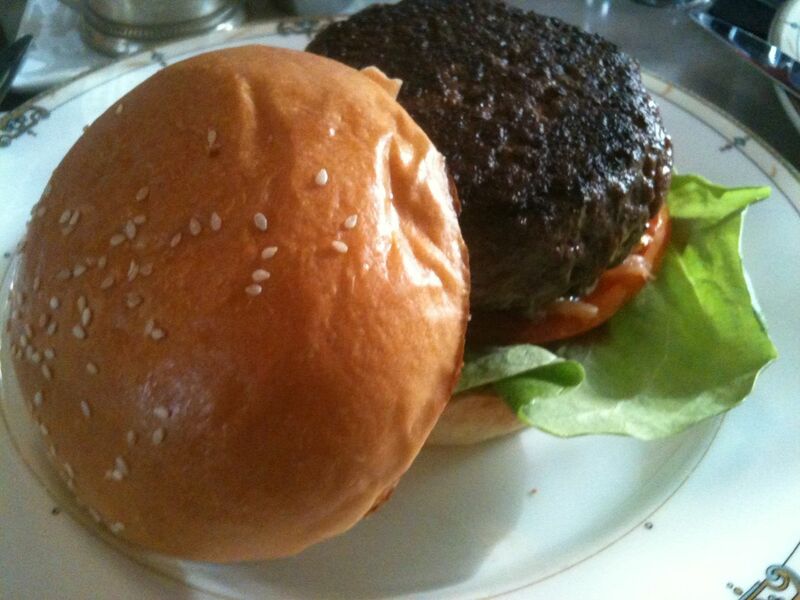 Then there are the sandwiches and, of course, the famous burger. Village Whiskey’s 8 ounce hamburger is sustainably farmed Angus beef from Maine, and the basic burger ($9.50) comes with tomato, bibb lettuce, house-made thousand island dressing on a sesame roll. Toppings such as avocado, crab salad, and various cheeses range from $1.50 to $5.50 each. For those looking to splurge, they offer the “Whiskey King” burger, topped with “Maple Bourbon Glazed Cipollini, Rouge Bleu Cheese, Applewood Bacon, and Foie Gras.” Other sandwich options are a Lobster Roll ($28), Veggie Burger ($8), and a BBQ Pork Sammy ($12). “Duck Fat French Fries” are available plain ($5), with Cheddar Cheese Sauce ($7), or cooked in a skillet with short ribs ($12). The three of us tried a number of these different menu offerings at Village Whiskey. We started with the “Cheese Puffs” bar snacks ($5), which were quite a bit different from the junk-food bagged cheese puffs most people are used to. Served in a small cast-iron skillet, these four round little puffs were oozing hot, melting cheese and were a delightful burst of flavor on the tongue. I had to try the basic burger, the only addition I added being the carmelized onions. The burger was perfectly cooked medium-rare to my request, bursting with juice upon first bite. The sesame bun was nicely crisped, and did hold together reasonably well despite the ample fillings–although I did have to finish my final bites with a knife and fork. We shared one order of the plain Duck Fat French Fries, and were all impressed by the distinct flavor the duck fat added to the fries. These medium-thick cut fries were perfectly crisp and stayed that way even after cooling down, unlike many fries which taste good when piping hot but quickly turn limp and soggy. One friend ordered the Fries with the Cheese and Short Ribs, which was an immense skillet of cheesy, gooey meat and fries. First bites were a little underwhelming, until one got down to the bottom of the skillet and tasted more of the cheese sauce and its necessary saltiness. 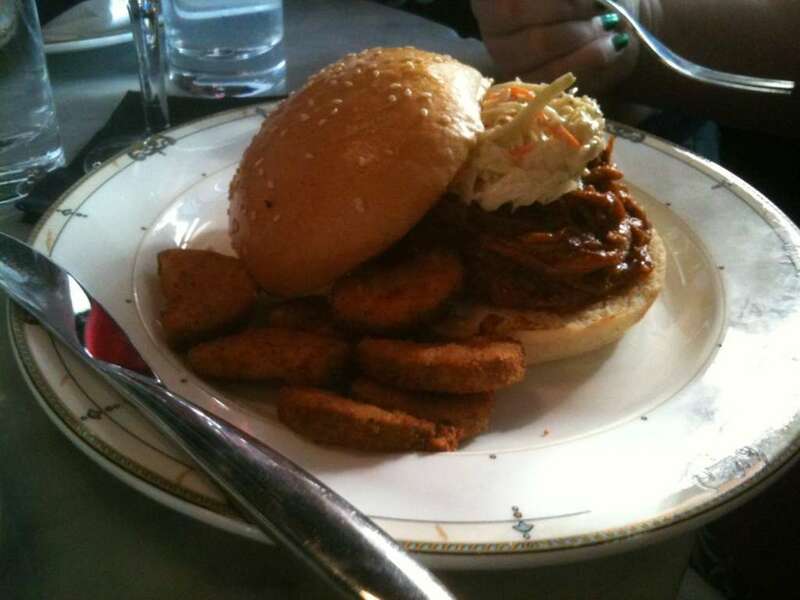 My other friend ordered the BBQ Pork Sammy, which was nicely dressed with cole slaw and served with excellent fried pickle slices. In fact I think those fried pickles should be offered as a separate snack or small plate, they are so good. After all this heavy food, a small dessert was all that could be managed, so we split one order of the “Irish Car Bomb,” a stout-laced chocolate cake ($6). This dessert made for a nice finish to the meal, not too rich and the chocolate-beer combination was intriguing. All together, the bill for our food plus three drinks was $85 before tip. Service at Village Whiskey was reasonably efficient, if not overwhelmingly friendly and cheery. The vibe is definitely upscale, catering to younger, hip Center City residents with ample paychecks. My personal bill was $45 with tip for burger, fries, and two drinks–about what one can expect to pay in an upscale gastropub in Philadelphia, Pennsylvania, but still more than I’m going to spend for what is still basically “bar food” on a regular basis. I’m not totally sure how the Village Burger compares with my standing Philadelphia favorite, Pub & Kitchen’s Windsor Burger. I will say it sat better on my stomach afterward, whereas I often find myself immediately falling into a “food coma” and needing to take a nap after eating Pub & Kitchen’s immense Windsor Burger. Overall, Village Whiskey in Philadelphia, Pennsylvania can be a good place to splurge on a well-prepared drink and nicely-executed bar food with an upscale twist. To beat the crowds, plan to go in the mid-afternoon or early-evening, after the lunch crowd dissipates and before the dinner/after-work crowd descends. If whiskey is your passion, however, don’t go to Village Whiskey unless you’re on an expense account or willing to spend some serious money. 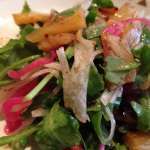 This entry was posted in Philadelphia restaurants and tagged center city, gastropubs, jose garces, philadelphia, restaurant review, rittenhouse square, village whiskey. Bookmark the permalink.